As the best DVD copy software, Aiseesoft DVD Copy can copy DVD-5 video to DVD-5 format, DVD-9 to DVD-9 in 1:1 ratio exactly and compress DVD-9 video to DVD-5 format. It also can copy DVD disk to DVD folder or ISO image files for backup and other use. Burn local DVD Folders or ISO image Files to DVD disk is available too. This DVD Copy enables you to choose audio track and subtitle, and you can choose including menu or skipping menu to meet specific needs. Besides, Aiseesoft DVD Copy can easily remove DVD protections such as CSS, RC and RCE. More surprising features are waiting for you to try! 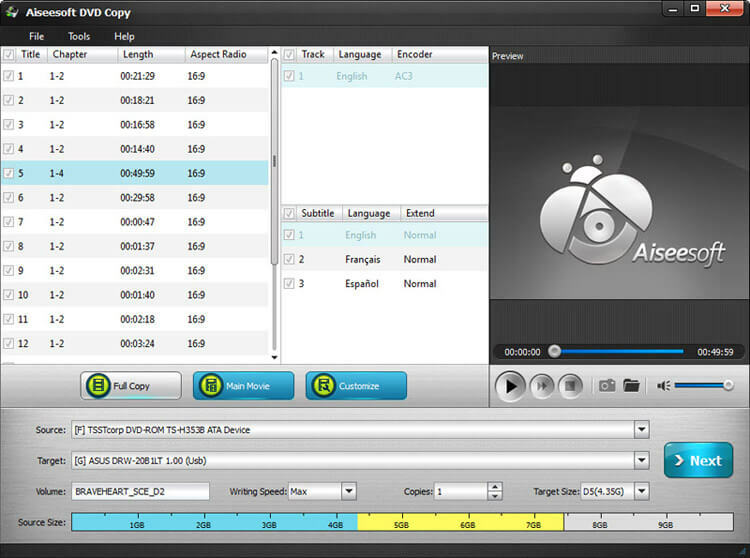 Aiseesoft DVD Copy is the best DVD copy software which can copy DVD to DVD, copy DVD movies from a dual-layer disc and backup DVD to computer. The best DVD copy software can copy DVD to DVD completely, such as copy DVD-5 to DVD-5, DVD-9 to DVD-9. With Aiseesoft DVD Copy, you can also compress DVD-9 movie to DVD-5 without quality loss. In order to protect your DVD, you can choose to opy DVD disk to local DVD folder or ISO image files for backup. For you to enjoy on DVD player, just burn your DVD folder or ISO files sources to DVD disk. It is also available for you to clone DVD whole disc with all the special features, intros, trailer and ads, or to copy main movie you just want to see. This DVD copier works pretty well with DVD+-R/RW, DVD-RAM, most DVD players and burners, and Dual Layer 8.5GB disc. How to copy DVD to DVD?